Evening all, we do hope y’all are well. A few physics and vehicular position fixes that will hopefully help those playing on co-op and dedicated servers. Improvements to loot kept on car seats, tweaks to the item disassembly system, and the removed item transfer progress bar being restored by public demand. Fixes to faulty item spawn rates (especially skill books) in MP, sheet rope levitation, aspects of zombie pathfinding, missing collision on various objects and various bugs squashed when transferring items between containers. And many other fixes besides. One other thing we might like to get into the build before release is some recent work that General Arcade’s Yuri has been doing on our Steam integration. We anticipate that quite a few people will want to come back to PZ to check out the vehicles, alongside their friends, and as such it seemed a good time to fix up some player invite issues – namely that PZ has always struggled with inviting players into games when both players already had the game open. We’ve got a build running that smoothens this out backstage, and may also consider adding this to the mix if it’s working as intended. Please also note that, as mentioned last week, in preparation for the vehicles release, the PZ map has been updated with Build 39’s countryside/vehicle exploration additions between Riverside and Rosewood. For community mappers and interested parties: new versions of PZ tools TileZed and WorldZed have been released, alongside the latest array of Tileset images. As regular readers will know, our Technical Director friend Bitbaboon Mark now has his own company called TEA – and he and his cohorts Zac, Chris, Gar and Schnitz are working on getting the new anims and models ready for the PZ codebase to switch over to them. This week from a technical standpoint they’ve been sorting meshes/textures and data that’s loaded from .X files and have hooked up character masks and ‘items’ to create individual characters from with everything hooked up correctly. The intention is to have the character config inside the dev/modding tool AnimZed – so people can quickly add and update meshes and put them onto characters to validate alongside the animations themselves. In fact Zac has a ‘random’ create for characters all running from AnimZed, and it looks a little bit like this. Music credit: MrEldfuel from free sounds. Please note: there’s clearly lots of different outfits and items on-show in this video – initial anims build releases will not contain everything seen above, especially if it involves combat markedly different to what’s already in-game. This is purely to show what AnimZed can do now, and the way that anim stances now change based on the weapon being held – which is all data-driven now. (Please also note: Spiffo’s Restaurant mascot outfits are supposed to look a bit… threadbare). Turbo is working on his remedy for the new snow/fog/storms system – in that it’s all fine and dandy having a climate system with morning fog and real-time storms forming and passing overhead, but not helpful when (as it currently is in-game) you can’t look out of the window to see what the weather’s doing. 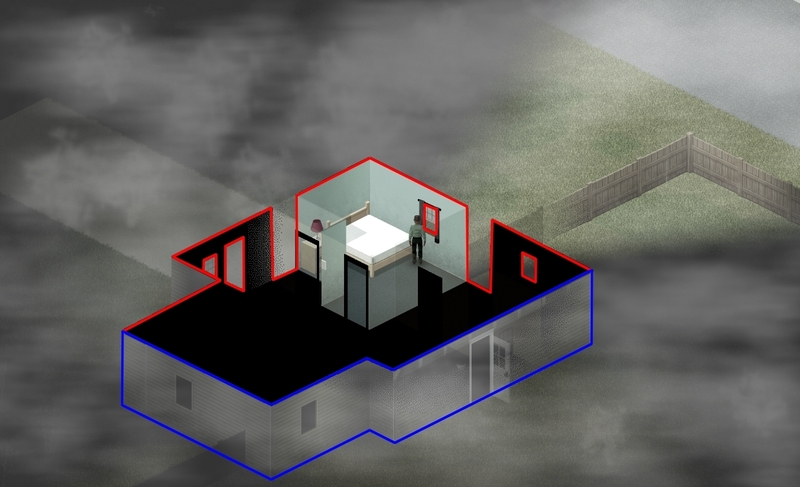 As such he has been exploring the possibility of using screen masking to allow for the player’s building to not be included in the rendering of rain, fog or other atmospheric effects. This will mean they will be visible to the character through windows, instead of being turned off across the screen when a player enters the house. Please note this is just a proof of concept and not fully implemented into the game yet. Meanwhile Stas continues his gamepad set-up improvements, Zach continues with his additions to the PZ soundtrack and Mash continues to build some of the larger new building locations to place within the expansion out to Louisville. This week’s fare from ㊣ $ℏìᶄ ㊣ . A general list of stuff added to PZ, and vids of features being worked on, is kept here – so you don’t have to plough through endless dev blogs for info. The Centralized Block of Italicised Text would like to direct your attention to the PZ Wiki should you feel like editing or amending something, and the PZ Mailing List that can send blogs like this and patch notes direct to your mailbox. We also live on Twitter right here! Our Discord is open for chat and hijinks too.